Mr Tan Juay Hiang is the Chief Executive Officer of Ascendas Hospitality Fund Management Pte. Ltd., the manager of Ascendas Hospitality Real Estate Investment Trust (A-HREIT) & Ascendas Hospitality Trust Management Pte. Ltd., the trustee-manager of Ascendas Hospitality Business Trust (A-HBT). 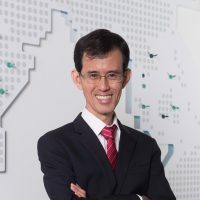 Prior to joining the Managers, Mr Tan held various positions in the Ascendas group including Senior Vice President of Real Estate Funds, Senior Vice President of New Products and Markets, and Head of Corporate Strategies, where he was involved in real estate funds raising and management, real estate investments, developments, and asset management. Mr Tan was also the fund manager for the Ascendas ASEAN Business Space Fund (the ASEAN Fund), where he was responsible for structuring the ASEAN Fund, raising US$400 million from institutional investors and deploying the capital. During his tenure with the Ascendas group, Mr Tan amassed close to 15 years of experience in real estate industry, across multiple countries such as Singapore, Japan, China, India, Malaysia, the Philippines, Vietnam and Australia. In 2012, Mr Tan spearheaded the initial public offering of Ascendas Hospitality Trust (A-HTRUST) (the stapled group which comprised A-HREIT and A-HBT), which was successfully listed on the Mainboard of the Singapore Stock Exchange on 27 July 2012, raising more than S$450 million from cornerstone, institutional and public investors. A-HTRUST was listed with an initial portfolio of 10 hotels across 6 cities, with an aggregate value of S$1.0 billion. Following the listing, Mr Tan oversaw two acquisitions which had a total asset value in excess of S$400 million, adding Park Hotel Clarke Quay Singapore and Hotel Sunroute Osaka (formerly known as Osaka Namba Washington Hotel Plaza) to the portfolio of A-HTRUST in June 2013 and April 2014 respectively. As at 31 March 2016, A-HTRUST portfolio has an aggregate valuation of S$1,525 million. Mr Tan holds a Bachelor of Engineering (Honours) degree from the National University of Singapore. He also holds a Master of Business Administration from Nanyang Business School, Nanyang Technological University.